ProFire 2626, FireWire audio interface from M-Audio in the Profire series. M-Audio is usually known for their small mic pres, but they also have some very high quality rack gear that works great. This device features 24 bit/192 KHz audio, 8 analog inputs, 8 XLR mic inputs, 8 TRS inputs, 2 TS inputs, S/PDIF, 16 x 16 ADAT, 8 TRS balanced line outputs, 2 headphone outputs, MIDI, a proper world clock for setting up I/O, master volume knob, an onboard DSP mixer, and it should work with pretty much any of today's DAWs. M-Audio did a great job setting this whole thing up. The interface itself is nicely laid out, and everything is easy to use. I'm especially happy that they used Firewire for this. While they make comparisons on the USB page stating how USB is theoretically faster than Fiewire, that's not the case in real life. There are some major flaws with USB 2.0 when compared to Firewire, and I always found it a bit dishonest when they tried to claim USB 2.0 was faster. Keep in mind that you'll probably want some sort of rack to mount this in. On top of that, it has a few breakout cables for some of the features, and I'm not really a fan of breakout cables. I never had a single compatibility issue when using this device. It's a very easy to use and straightforward device. There's no need to even read the manual because everything is laid out in an easy to use and understand manner. Simply plug in the devices to their corresponding ports, and you'll be good to go. I was able to use this in Logic without any hiccups, and it sounded awesome. If you're one of those people who enjoy rack interfaces and want one of the better ones out there, check this out. This has some really nice and clean converters that sound great. It also has MIDI and tons of other features. I just wish it didn't have all those annoying breakout cables for certain features, but then they'd have to make it 2U, so I can see why they did it. 6 ms latency with 44.1 kHz sample rate and 256 samples (if I recall correctly)... It's not that important, the main thing is that the latency is short enough for good monitoring with Cubase. When I bought it I wanted to record a band at home and to have more channels available... But it sounded perfect when I used it. It worked 45 min. straight without interruption using all 8 preamps without a single hitch. I've been using it for almost everything I've recorded ever since. I cannot compare it to anything else right now, but the preamps seem to sound very transparent like most modern Chinese preamps. Wide dynamic range and frequency response, I can't hear any sound alteration. It's exactly what I was looking for. The PAD function is very convenient (other products should follow this example...) and it definitely influenced my purchase (it's a must have feature for drums recording). I've been using it for one month (I will update this review if I change my opinion). Excellent product with professional quality (considering a professional is someone who KNOWS how to use and set the gear). - What technical specifications have motivated your choice? - What is your config (Map mother / CPU / Ram / Hard, ...)? - Which instruments or systems (console, prampli, DTD ...) you use it and how connections ...? - Is Gnrale configuration is easy? Yes, especially since I had already a firewire 410 whose system is similar. - Is the manual is clear and sufficient? ...? Difficult to say because it is trsrcent. - How many tracks you record / play simultaneously ...? Plus, 8 pramplis of very good quality. Very good, a very good way to make a little home studio and record in good conditions. Djlive07's review (This content has been automatically translated from French)" tools of every day! really useful to have!" What caractristques tech. have motivated your choice? 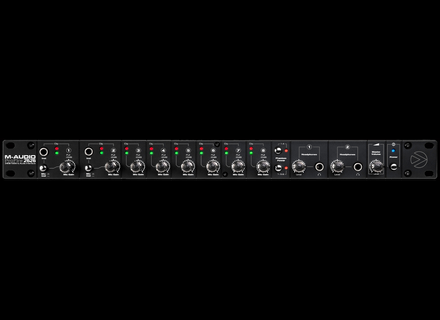 -First, It is available in 8 audios among XLR and 1/4 and its 8 outputs 1/4. -Then Is that it plugs into Firewire, so it's more reliable than the usb! -The Eight audio outputs can be assign virtual instruments. -The Possibility to be connected in two sets! Which instruments and systems (console, prampli, DTD ...) you use it and how connections? I use it with a mixer Behringer eurorack 12 entries. To which the instruments, I use with electric guitar, a keyboard Technic, mixer DJ SCS.1m a Korg synthesizer Er mkii and m-audio microphones. to which the connection I almost only uses XLR cable. I love the fact that he provided a cable panouis. I also use it as a card for his DJing, the 8 audio outputs rvlent be very useful. Especially since it has its quality compar to map outputs made for DJing who has only RCA output! That having output and input XLR or 1/4 are so expensive, often on top of $ 1,000,00. When I connect Mixe all outputs to input my Behringer Mixer and-controlling EQs is better than a dj program. What is your config (Map mother / CPU / Ram / Hard, ...)? The drivers are very stable, they have never permit me tomb. They are put - days from time to time ... I remember the last time have! I never touch because it never made me default! How many tracks you record / play simultaneously? I never try more than 8 tracks. The installation being done without problem? 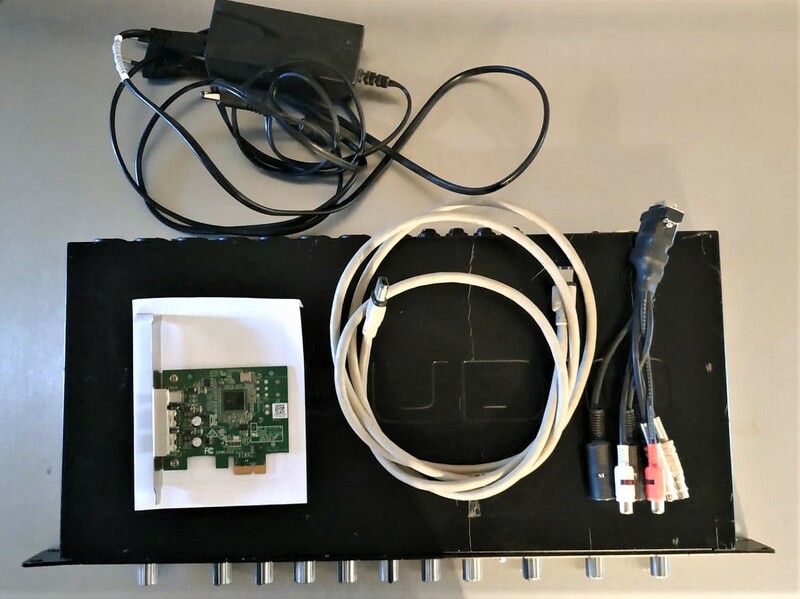 Installation is very simple and requires no Gnis be a computer! Is Gnrale configuration is easy? yes enough for a basic registration. Otherwise there has read the manual (a lil flies only) to understand all the functionalities of the DSP Mixer if we are not very familiar with the sound hardware. By the way, the suit mixer (blender) DSP is so useful once you understand how it works! Have you encountered the incompatibilits? yes with Sony Sound Forge to record if not for reading that's ok.
yes the manual is very well and explains very well the operation of the machine. One bmole! Is having to have the computer shut down or in sleep to be able to connect but otherwise everything is great! I've had a year bientt and she never made me default. Contrarement and many other advice I have read, none of my knobs did ramolit or breakage. but not the sound engineers that I know and sound technician me about the l. So I have to rent a one week then I realized c'tait excelling for the offered price. My much: his Standalone mode. -Its Among eight combined XLR to 1/4 among. - It is the duty to have the computer shut down or in sleep to be able to connect the computer. Excelling, after having store for a year of sound cards on the web and on the forums is the one that was giving the best performance for its price and its characteristics. Yes very definitely! Btw I'll buy a SECOND.